Chanelle Medical & Chanelle Veterinary develop and manufacture generic (copycat) drugs, holding more than 3,000 medical product licenses in over 93 countries. They have won many awards, including the Life Science Award at the Deloitte Technology Fast 50 Awards 2017, Exporter of the Year 2016, Life Sciences Exporter of the Year 2016, Export Innovation of the Year 2016, Winner of ‘Project of the Year’ at the Pharma Industry Awards 2016 and the Ulster Bank Business Achievers Award 2015. 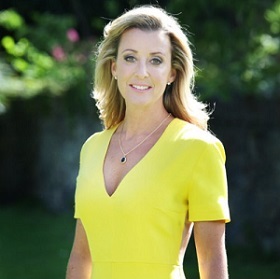 Chanelle is a popular business, leadership & motivational speaker due to her experience of co-heading up Ireland’s largest indigenous Pharmaceutical Company, being responsible for over 450 people and turning-over in excess of €110m. She is also a huge supporter of women in business and mentoring young entrepreneurs. Her key-note and after-dinner speeches, Q&A sessions cover a vast number of subjects such as growing a business on a global scale, leadership styles, women in business, time management, work life balance, next generation work force & using initiative. To book Chanelle, Lady McCoy for an event or to talk to us about your event requirements, please submit the enquiry form or call us on 087 718 1360.